Café Noir is a cute, tiny, fun little café on Rue Montmartre, in one of my favorite lively areas in Paris, that being the two parallel streets of Rue Montmartre and Rue Montorgueil. Highlights at Café Noir include a leopard-spotted bicycle hanging over the front door inside and quotes by Serge Gainsbourg on the walls. This place brings in a neat, somewhat artsy crowd a lot of weeknights — I know because I used to be part of it, ha! 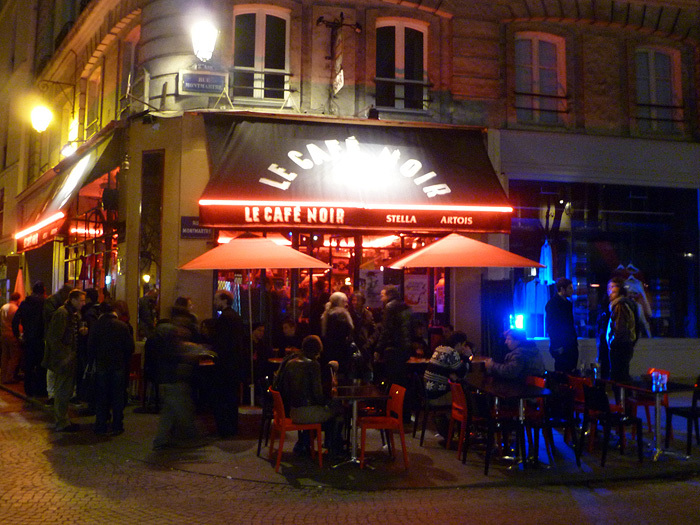 My fiancée used to work in a young/hip fashion company right around the corner from Café Noir, and she and her colleagues would often grab a drink after work here or at one of the other cafés/bars in the neighborhood. It's a sweet, laid-back place. Check it out!